The athletics a kind of sports also comprises of driving force of other kinds that require physical training. One of the first Olympic medals in the composition of the USSR national team was won by athlete Yuri Konovalov. He has been awarded the silver medal in 1956 Summer Olympic Games in Melbourne at the 4x100-meter distance race.Azerbaijan had the European and world record-breaker in athletics. However, this kind of sport suffered a great decline since the end of 1980 in the country. In those years many specialists have left Azerbaijan. 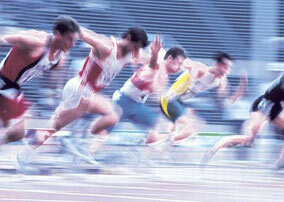 Sportsmen, in general, left the sport.Athletics Federation of Azerbaijan was established in 1992. Federation became a member of the Federation of Asian Athletics. In 1996 the issue of transition from Asia to Europe was raised. Due to lack of time the matter of membership of EAA was not solved until the congress of the International Association of Athletics Federations (IAAF) in 1997. Therefore, AAF was represented in Asian competitions by 1998. In 1999, at the IAAF Congress held in Seville, Spain, AAF was accepted to EAA membership. In 1997, Sergey Bochkov was awarded with bronze medal at the Asian championship among teenagers. In 2008, two athletes Ruslan Abbasov and Ramil Guliyev won a license for Olympic Games in Beijing won the gold medal in Slovakia at European Championship on athletics.